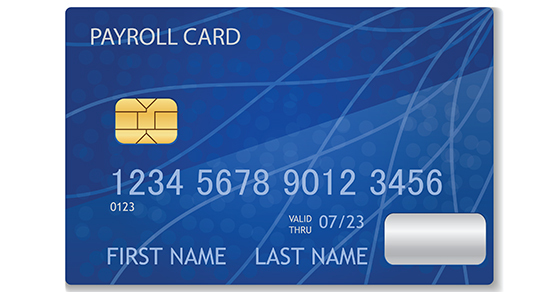 Are payroll cards the right call for your organization? Payroll costs are a natural and unavoidable consequence of being an employer. But this doesn’t mean you can’t keep an eye out for ways to lower these costs or simply handle payroll more efficiently. One approach that many organizations use is issuing employees a payroll card (much like a credit or debit card) that they can use to access funds earned from working. Payroll cards are most commonly used by larger employers with many hourly workers, so they may not be the right call for every organization. The most substantial savings typically comes from payroll cards’ advantage over paper checks. According to NACHA, a nonprofit that oversees the widely used Automated Clearing House payment system, electronic methods such as payroll cards can save employers between $2.87 and $3.15 per payment over paper. Payroll cards may also offer a more convenient and secure way of compensating employees who don’t have traditional checking accounts. Interestingly, however, a July 2018 study by the Center for Financial Services Innovation found that 84% of payroll card users do have checking accounts. So, this approach isn’t necessarily limited to “underbanked” individuals. There are two major challenges to issuing payroll cards. First, there’s the law. On the federal level, the Fair Labor Standards Act, as well as guidance issued by the Consumer Financial Protection Bureau, directly impacts the use of these cards. Employers must disclose all associated fees, give recipients a choice of where funds are deposited and offer an alternative means of receiving compensation. At the state level, it’s critical to check into the applicable rules in your area. The treatment and limits imposed on payroll cards vary from state to state. As of December 1, 2017, 28 states had wage and hour statutes and/or regulations that expressly authorized the use of payroll cards, according to an American Payroll Association white paper issued earlier this year. The second major risk is that of potential employee conflicts. Many workers initially like the convenience of payroll cards but don’t fully understand or remain cognizant of the fees and restrictions involved. So, even if you initially explain how the cards work, you’ll regularly need to remind recipients of the details. Given their legal uncertainties, payroll cards are an idea you should approach carefully. Involve your attorney to determine whether it’s right for you. For further information and other ideas on lowering payroll costs, contact us.